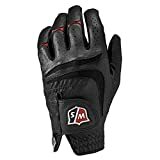 Offering a splendid combination of fabrics applied in a layered order, the Wilson Staff Grip Plus men's black golf glove grants optimal fit, excellent feel, and proper resilience. It's a left-hand glove with heat dissipating, anti-microbial mesh placed between finger to ensure confident and comfortable performance. There is also a high tech digitized palm for enhanced grip, and leather inserts on the thumb and palm area for overall improved durability. The gloves comes conveniently with a snap ball marker at the cuff.